Today’s Flash Back Friday comes from Episode 147, originally published in May 2013. Being prepared for what’s out there is important—you have to know what to do when everything falls apart. Knowing how to survive the end of the world as we know it will prepare you for anything and everything that could possibly go wrong. From packing the proper survival kit, to surviving on the battlefield, being physically fit, and coping in the event of a socio-economic collapse, Soldier of Fortune magazine, along with N. E. MacDougald, will make sure that you’re never caught off-guard. The purpose of this book is to provide the reader with real-world, practical information that will help them to not only survive, but thrive during a period that is likely not just another downturn in the economic cycle, but according the many experts, instead the beginning of a long downward slide, and possibly the very peak in our 10,000-year experiment of civilization. 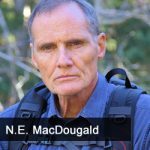 MacDougald will give you the training and knowledge that goes into surviving every dangerous situation imaginable. While you may not plan on being in a war zone, you never know what will happen, so the best thing to always do is be prepared. Learn how to barter and haggle, get the proper camouflage, and choose the right weapon for any situation. Be prepared, be smart, and be able to survive the end of the world as we know it.